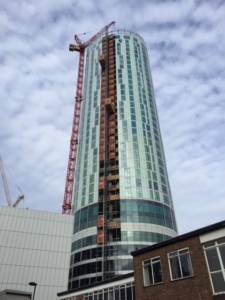 Although the Sky Gardens is not among the tallest structures in London, its unique design presented its own challenges for us to come up with a safe, viable solution to install 5no WLB200 to the structure. The top level of the Sky Gardens is encircled by glass panels, which meant that the Aircraft Warning Lights had to be installed in such a way that the lens of the light was above this obstruction. If the lens had been below the glass panels, the light emitted would have been refracted by the glass, meaning that aircraft would not be able to pinpoint how high the structure was when passing over it, risking potential disaster. The proposed Building Maintenance Unit (BMU) on the roof of the structure also presented a challenge, as it was briefed that the WLB200 was to be fixed to the top of the wall on the raised section on the roof. However, this presented an issue as, due to the height of the wall and Aircraft Warning Light combined, this risked the light being damaged or broken whenever the BMU was used. The solution our engineers came up with was to move the light in a similar way to the glass panel problem. They lowered the base of the light so that the lens would sit higher than the small wall that surrounded the raised section of roof, making it so that there were no objects in the way of the light beam. These actions were approved by the client as they made sure that the Aircraft Warning Lights were in the most effective and safest position on the structure. Since the completion of this highly prestigious contract, ESG has provided Delta with other contracts from supply, to the commissioning of; various Aircraft Warning Lights. Showing that Delta’s exceptional quality of work at Vauxhall Sky Gardens gave our client the trust to supply Delta with further contracts.